Docker is an open source project that automates the deployment of applications inside Linux Containers, and provides the capability to package an application with its runtime dependencies into a container. It provides a Docker CLI command line tool for the lifecycle management of image-based containers. Linux containers enable rapid application deployment, simpler testing, maintenance, and troubleshooting while improving security. Using Red Hat Enterprise Linux 7 with Docker allows customers to increase staff efficiency, deploy third-party applications faster, enable a more agile development environment, and manage resources more tightly. To quickly get up-and-running with Docker Containers, refer to Get Started with Docker Containers. Platform Image – an image that has no parent. 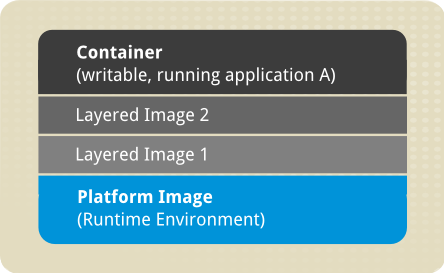 Platform images define the runtime environment, packages and utilities necessary for containerized application to run. The platform image is read-only, so any changes are reflected in the copied images stacked on top of it. See an example of such stacking in Figure 7.1, “Image Layering Using Docker Format”.